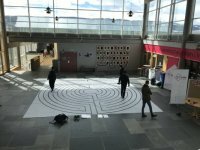 8 labyrinths found. Showing 1-8. Sorted by country, state, city, then zip/postal code. 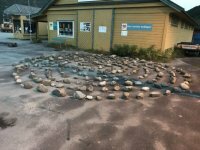 It is a rock labyrinth in a parking lot of a book store. Part of the famous Vigeland sculpture park in Frognerparken, located in the neighborhood of Majorstua. Easy access by bus and light rail. Large, public park filled with statuary by twentieth century Norwegian artist, Gustav Vigeland. The brickwork labyrinth is located around the central fountain. 59*55'36.62''N° Lat. ; 10*42*05.56'' E° Long. Evergreen hedge labyrinth in the classical style. A short distance from the medieval Ramnes church. Site of the 1177 battle between the Birkebeiner faction and King Magnus Erlingsson, for control of the country. 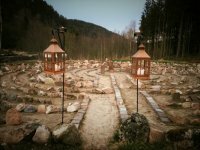 The labyrinth, memorializing this event, is composed of 1177 evergreen bushes. It was planted in 1992.